Joinville is the biggest french team tournament, and he usually draw the french WTC teams as well as a bunch of foreign team. In addition to that, it’s very close to Paris, so they really weren’t any reason to not go here. As you may guess, the name come from a certain band. It’s composed of a Skorne player (me), an Everblight player (Shredinette), a Cryx Player (Kurogami, who just came back from travelling the world), a Minion player (Boneblade, a farrow specialist who hand out sausage to his opponent :p), and Grimgor, a Troll player from the south of France that we recruited to finish the team. On paper, we are one of the best non-WTC french team, with three person who could realistically get into a WTC team, while the other two aren’t pushover. No change at all since three months. I think I have got the good balance of things. My Croak were loaned, so I defaulted to double Ferox by default. I wanted to play a Gatorman Husk instead of the swarm, but it wasn’t finished painting ; and I wonder about using bog trog ambushers instead of keltariis. While americans talk a lot about Asphy 3 (and bad version at that ; seriously, don’t take full slayers), the top Cryx list in France is Skarre 1. It’s usually played with 5 stalkers and 2 Battle Engine, with banes to round up the list ; and it’s super oppressive. In my team, Kurogami play exactly that, and the captain of France 1 is on that list too. The second list depend on taste, with no clear consensus on what it should be. Stalkers and BE become really scary under Skarre feat, both because they actually hit like trucks, and because 12/23 or 15/18 is an hell of defensive stats. So usually, you get alpha’ed (stalkers are wiked fast after all), and then with a severely depleted army you need to destroy a bunch of high def, high armor models. While there are occasional discussions on Skarre 1, Kolgrimma Storm of the North seem completely absent from America. And that’s seriously strange ; champions + fire eaters + bears is a deadly combination, and the clouds of Kolgrimma mostly mean you get both the non-charging feat from Madrak 1 and the effectively +2 def, all that every turn. Kolgrimma is also feared for her ability to kill a caster with three or four POW 14 sprays. Pairing with her are scattered here too, but Madrak 2 start to look like the standard pairing. Haley 3 isn’t yet very common (but it start to be ; in Joinville half the Cygnar player tried it, which is a change from near-0 representation before that), and in fact no list are really common. Still, there are a lot of Cygnar players, and consequently it’s important to have a solution to high power guns. That list was pionereed by Tza last year at the WTC. The french version forego the lights to only play cage ragers and Skin&Moans. The list have decently high armor, and a lot of options to soften the initial alpha ; then, it use Manifest Destiny to kill everything with the survivor. It’s a very slow list, and it want to play second to mitigate scenario problems, but it deal extremely well with jack, and well with everything else. The other factions are significantly less common and feared. For the sake of completion, I would cite Krueger 2 / Bradigus in Circle, Butcher 3 in Khador, and Lich Lord Elara in Scyrah among the slightly less common lists. It’s the home team ! I know most of the players in it, and Trippe is by far the best one, followed by Slec. We sacrifice our poor troll players to Trippe and the other get decent to good matchup. I get paired against Sajuuk, a good Khador player but who don’t play that often. He play Strakhov and Irusk 2. I think the Irusk 2 list still don’t hit hard enough to worry my Zaadesh list, but the day before the tournament I had won against a full jack Butcher 3 list with Morghoul, so I think it’s less risky to take Morghoul. He win the roll off, and deploy only a Juggernaut on the left, with both a Juggernaut and the devastator to the left. The rest is in the middle. Because of that, I decide to push hard on the left side, while letting only the Keltarii to contest the other side. The cats hide behind a house, then quickly dispatch the Juggernaut and take over that flank. On the other side, the keltariis stay too far away for him to efficiently dispatch them, so the contestation plan work well. Torch die to a gladiator, my opponent try an assassination that fail because of an order of activation failure (it wasn’t terribly likely to work anyway, it was a POW 9 and 2 devastor melee attack on a caster who camp 2), and in reaction I kill Strakhov who was next to the objective by applying mortality, then three cats. The team won 4-1. Shredinette easily make a turn 2 scenario victory against Iria, Grimgor lose against Trippe (which was expected TBH, there is a real skill gap here), the other two win their match more or less as expected. Ouch. That’s the best french team by a significant amount. The good thing is that their captain isn’t here, replaced by a good troll player. It’s possible for us to win, but it will be very hard. We try to get me against Plazma, their Cryx players, but it fail ; I take instead Journeyman, who is an excellent Mercenary player who play Magnus 2 and Ossrum. I have played a bit against Magnus 2, but against bad players, so I fear to do an error and lose to his feat. SPOILER ALERT : it’s exactly what happened. He did say he played badly, but when a very good player play badly, he still get most things right, so it’s still difficult to exploit. The team lose 4-1. Shredinette is our only win ; Kuro lose a close match against Cryx that was winnable but difficult, Boneblade lose against maybe the best player of their team, and Grimgor try all he can but finally yield to Julien Lesage. Honestly, that was what we expected, but still a loss. It’s a belgian WTC team. More or less at our level of skill on paper, but never underestimate that kind of opponent. I get paired against Sharkface, their troll player. He play a formidable Kolgrimma list, and a Borka 2 list that isn’t a problem when you have an hydra. Mostly, it’s a way better Madrak 1. The cloud give def 16 to the champions, and they go much farther, with a feat who can be a beating. Still, I begin to have a plan against that list with Zaadesh, and I will check if it still work as well. The 1st part of the game is me killing the fire eaters before they can kill the agonizers ; the agonizers are a massive problem because with them he don’t hit hard enough, but with counter charges and the sprays, I am able to deal with them correctly. The 2nd part is killing champions ; I actually used the hydra as a bait to be able to sweep them better. Almost all of them die on my feat turn, partly because they weren’t much cloud to protect them due to Kolgrimma needing her fury to do other things. At the time of that picture, I was wondering about sending an hydra under feat into his champions, charging the objectives and unloading up to 8 attacks into the champions. I ultimately backed out of that idea to force him to come closer, leaving him with a bigger scenario advance. Next turn she did charge the objective, but to kill Rok mainly, which benefit a lot less from the cloud to-hit malus. The final part is being 0-4 in scenario point, and before turn 7 get at least to 4-4 (I am way far ahead at attrition at that point). That mean killing all the stragglers while being aware of the assassination threat of Kolgrimma. It work out in the end, because Spiny Growth really make her assassination a lot harder. A counter charge seal the deal by preventing him from contesting. Our team lose 2-3. Kurogami lose his game vs Grymkins (it’s very hard to win its first game against Grymkin to be honest), Boneblade fail a very high odds assassination (like, he needed to not roll 2 two time in a row to seal the deal), and Grimgor lose a close match against Cryx, where he was surprised by the list choice. Shredinette won against Haley 3, because the top meta list can’t stand in the way of a motivated blight player. It’s one of the older french team, who lost some of his player to the WTC teams. They have double skorne, and both have viable, different lists from me, a consequence of how good a job PP did with Skorne compared to, well, most other factions. I got paired against Troll again ; it’s expected since Kolgrimma is a really hard matchup for most other factions. He play Kolgrimma and Madrak 2. Unlike Borka 2, Madrak might be a problem for Zaadesh. But only might ; Fennblades don’t hit that hard even with WM, and they do die in drove to sprays. He play Kolgrimma, probably a reasonable choice in that situation. Few difference with the preceding one. I do think it’s better to have two fell Caller Hero, just in case. The champion hero on the other may be a bit strange, but some list really don’t like ret strike on champions. He admit from the beginning that he never played against Zaadesh. His two skorne teammate brief him before the match ; but to no avail. I actually get to spray the fire eaters even before they can be a problem, after which he desesperatly try and fail to kill the Hydra. While he forget Counter Charge less often than my opponent in the previous round, it still cost him a lot. He also forget about Orin and have to spend 8 fury to Hunter Mark the Hydra, leaving his army totally defenseless against my onslaught. In addition to that, it’s a good scenario for Zaadesh, unlike The Pit II, since he don’t have trouble scoring. In the end, I prevail after killing almost all his army and building a fair share of control points, in no small part because a forest allowed my caster to stay on his flag. Our team win, too. It’s the third french WTC team. Both me and Kuro want to prove our WTC-fitness, and the team failed at the first two attempt, so we are highly motivated. Still, the team is pretty strong. SuperSub is actually a last minute replacement due to their Cryx player not being able to make it. They sacrifice him, and I got paired against him, in one of the most one-sided match up possible in the game. He have Brisbane 1 and Kraye 1, both who are hilariously inept at breaking armor 23 (or more !). He can choose between Kraye to hope for a surprise assassination, or Brisbane to hope for a surprise scenario win. My opponent is briefed a long time by the other Cygnar player (Nicoco, a good Cygnar player), but we both know how bad things are. He get the second turn ; I bodly advance the hydra on one side, while the rhinodon and sentry advance on the other side. Inviolable Resolve is on the Sentry, who block most possible thunderbolt move on the Rhinodon. He try to steal a scenario win by running a solo to my flag and jamming my hydra ; but the archidon suceed in unjamming the hydra, who proceed on emptying his zone and scoring in it, while I contest my flag with a Krea. On the other side, things are equally dire for him, with a rhinodon contesting his flag and a sentry immediatly behind. Meanwhile, my caster is behind two beasts, with Orin to protect against Force Hammer. He try to use his feat to kill a beast, but to no avail (I make sure to transfert the ground pounder to the hydra and not sac pawn it to a beast to avoid it being killed by effectively taking two AP shots). In the end, he lose on scenario, while only having his caster and some mechano on the table. The end of the round was a bit tense. 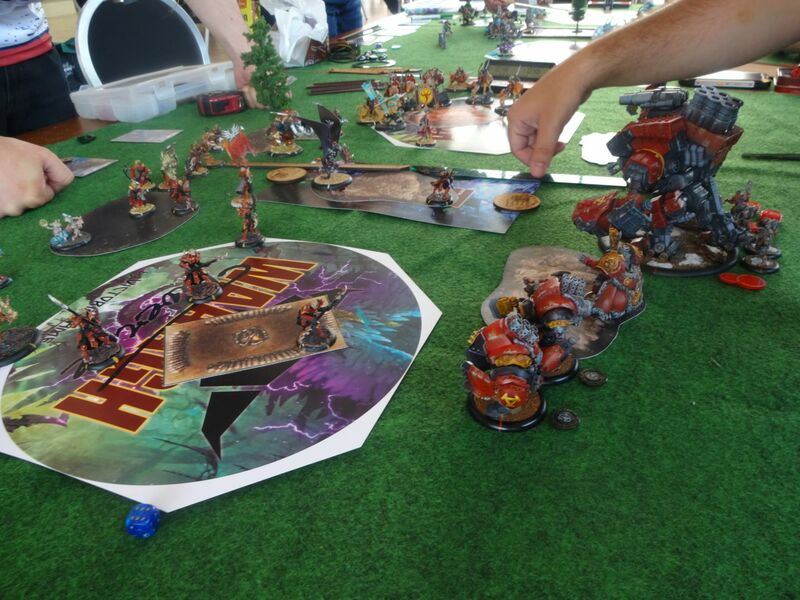 Kuro win against Nicoco (Cygnar) on the back of being first player and having a good table ; Shredinette surprisingly lose against another Blight (that happen, and she said his list were good counter to her), so it’s down to the last two match. Grimgor lose a very close game against the opposing team captain, but Boneblade save us by opposing the might of the war hog to the so-called divinity of Menoth ! The top 4 is composed of France 1, France 2, Belgium 1, and a swedish team. Belgium will win the tournament in the end, with France 2 being immediatly behind and France 1 at the third place. That’s encouraging for the WTC since none of our teams were at full force, and France 1 have the curse of alway having a player that punt an important match in Joinville :p.